Hey it’s Carisa here – from Messes to Memories. I’m excited to be back and sharing one of my family’s favorite summer time treat!! 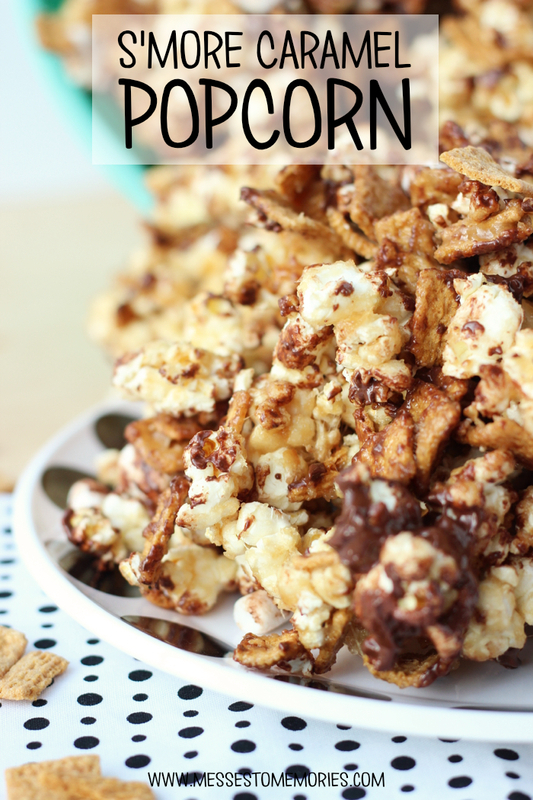 This is a delicious, rich and crunch S’more Caramel Popcorn! Now this treat is gonna get messy. In fact, its supposed to be messy… I always have to convince my daughter that its okay to get your fingers dirty every once in a while. The amazing thing is she ate a whole bowl of popcorn and her fingers were perfectly clean – she didn’t even lick them. She was just SO careful when she was eating. You can see how messy and chocolatey the popcorn was, isn’t that just crazy??? This snack mix can be modified to be as rich as you would like. Ours was super rich!I know you’re here because you want to know how I made this delicious popcorn. Let me tell ya, it was pretty easy!You need to make sure you have everything ready to go… popcorn popped and all the S’more Mixture ingredients open and handy before you start the caramel. I put semisweet chocolate chips in before the caramel and a cup of milk chocolate chips after it had cooled for a little while. I love the milk chocolate because it makes it so rich. I mean, if you are gonna eat dessert, you might as well do it right. S'more Caramel Popcorn is the perfect treat for a summer movie night! Melt the butter on the stove, add the brown sugar and marshmallows and stir until a smooth caramel forms. Combine the popped popcorn, golden grahams, 1 cup marshmallows and 1 cup chocolate chips. Pour the caramel over a cup at a time, mixing each time to coat as much as possible. Looking for some more delicious S’more recipes?? Click on the pictures below to stop by Messes to Memories for some delicious S’more Granola Bars, Skillet S’mores, S’mores French Toast and so much more! !